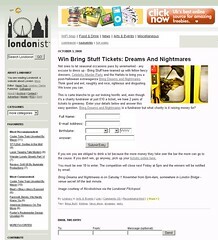 Browse: Home / Blog / Win Dreams and Nightmares tickets! I truly love many things about London – and one of them is the Londonist weblog. Those Londonistas, who know a good time when they hear about it, are giving away two pairs of tickets to our next Bring Stuff fancy dress party, Bring Dreams and Nightmares: CMP X. Go and take a look at the competition and see if you can work out the answer to the question – here’s a hint, you’ll need to come back here to get the answer! The competition runs until Friday 10th October at 5pm all around the world, not just in London. A Facebook-friend of mine flipped me the link to your absofrigginlutely wonder-fun Halloween bash on Saturday. How do I do to purchase a ticket? I’m totally in! Hey there Laura – you’ll need to head over to this page and click the Paypal link to buy a few tickets! It should be simple, but holler if you need any help.